(August 8, 2003) -- We post below pictures taken in Long Beach, CA, the state's fifth largest city, on August 7, 2003...the same day Lt. Governor Cruz Bustamante announced he is a candidate for Governor if voters recall incumbent Gray Davis. Lt. Gov. Bustamante chairs the State Lands Commission, a three-member body, comprised of the Lt. Gov, State Controller & Gov's Dir. of Finance, charged by the state legislature with overseeing the use of state lands. These lands include CA's tidelands, submerged or filled areas along the CA coast. In Long Beach and other CA coastal areas, the state legislature gives local governments the ability to use the state tidelands in public trust, limiting uses to recreation, fisheries, port commerce and the like. The State Lands Commission's role is to ensure uses on the state tidelands remain within the public trust uses allowed by the state legislature. 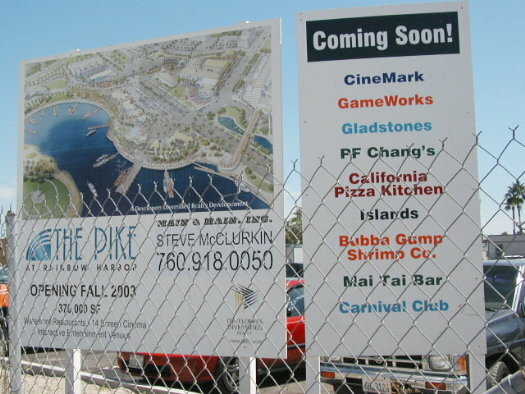 In April 2001, Long Beach City Hall sought State Lands Commission approval to put retail and entertainment uses on tidelands as part of what was then called "Queensway Bay" (later renamed the "Pike at Rainbow Harbor"). The area was (within the memory of middle aged taxpayers) previously sand, water and the site of the former beachfront Pike amusement area. 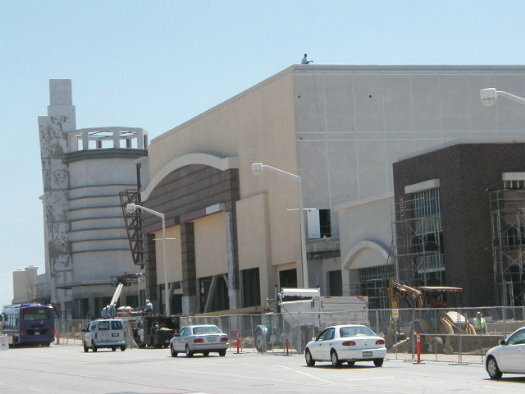 City Hall's plan to put a multi-screen movie theater and certain other commercial uses on the tidelands angered a number of local activists. Calling it a "shopping center by the sea," they charged this wasn't what state tidelands trust property should be used for. At the April 2001 State Lands Commission meeting, Lt. Gov. Bustamante and then-State Controller Kathleen Connell expressed unease with what Long Beach City Hall proposed to do. Connell voiced concern about not setting a precedent that might be replicated elsewhere. Bustamante added he couldn't justify such uses on state tidelands without receiving additional public benefits for state taxpayers. Both Bustamante and Connell balked at approving LB City Hall's plan. Over the next few months, LB City Hall and State Lands Commission staff worked to devise a deal Bustamante and Connell accepted a few months later...over the objections of local activists: the tidelands trust restriction would be removed from the footprints of problematic uses (including a multi-screen theater among them), portions of the site totaling about three acres. In effect, the state would agree to transform large problematic commercial footprints from restricted state tidelands into ordinary unrestricted land. In return, LB City Hall would give state taxpayers about 10 acres of replacement land on which tidelands restrictions would apply. What would state taxpayers get as replacement "tidelands" public trust property? LB City Hall offered about 10 acres of polluted, formerly industrial chunks near the L.A. river, some of it miles inland from the coast...and City Hall boosted the total acreage on paper by including a landscaped freeway median, inaccessible by the public, which sits in the middle of 710 freeway lanes leading into and out of Long Beach. Activists promptly dubbed the freeway median "Asthma Park" and expressed alarm over the ramifications of enabling coastal commercial development by erasing tidelands restrictions at the shore and moving the restrictions to dubious property miles inland. Tidelands trust swaps had been done before, but they usually involved relatively small areas, isolated parcels, lot line type adjustments and the like. They had not generally involved large commercial footprints to facilitate a multi-acre commercial development. A number of residents also recalled that this tidelands area had been filled using half federal funds and half local bond funds, the latter enabled in a ballot measure passed overwhelmingly by LB voters to restore the shore. To allow the tidelands trust swap, the State Lands Commission had to make the official finding -- and did -- that the tidelands property involved had become useless for its tidelands purpose. That devastating determination -- which might have been an embarrassment to other coastal cities -- was actually sought by Long Beach City Hall. 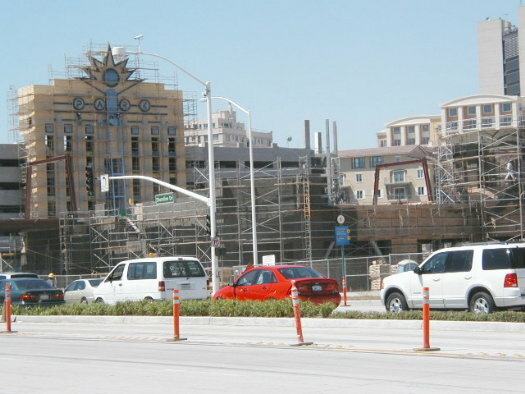 What the State Lands Commission allowed in Long Beach has reverberated elsewhere on CA's coast. Some developers seeking to commercialize the shore have begun citing Long Beach as justification for turning tidelands into ordinary commercial land by shifting tidelands restrictions miles inland. For that reason, we believe the pictures below carry importance beyond Long Beach. We believe they indicate the types of uses invited elsewhere along CA's coast because of what the State Lands Commission did with Lt. Gov. Bustamante's voted approval. Convinced this poses a serious risk to all of CA's tidelands, the statewide environmental group California Earth Corps has challenged the State Lands Commission's action in a Court of Appeal (currently pending). Also problematic to Earth Corps: the public trust land wasn't swapped for land of equal public value...but for land deemed to have equal appraised financial value. The state legislature could stop or limit future tidelands swaps. It hasn't. In fairness, Lt. Gov. Bustamante didn't create the Long Beach situation. He inherited the result of decades of Long Beach policies. 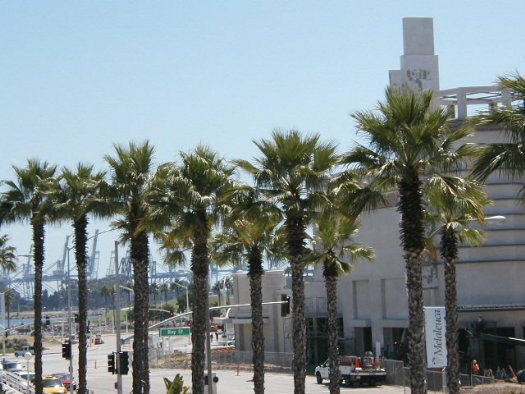 Long Beach City Hall supported the project. City officials brought it to the State Lands Commission, not vice versa. When they did, Bustamante declined to rubberstamp it. Lt. Gov. 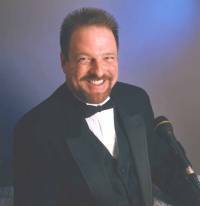 Bustamante has previously earned high marks from environmental groups. But at the end of the day, Lt. Gov. Bustamante's "yes" vote facilitated what you will see below...which has arguably invited further tidelands swaps that could commercialize other parts of CA's coast. For those viewing this page outside Long Beach, be aware that in Long Beach the ocean is south, not west. 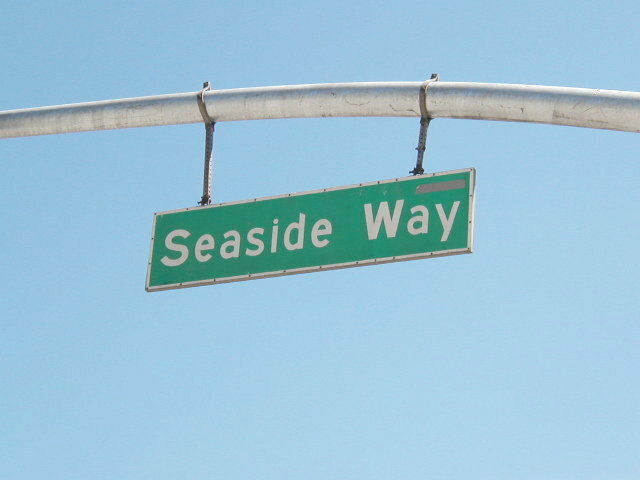 The photos are all south of Seaside Way...where the former beachfront Pike amusement zone, sand and sea used to be. South of Seaside Way along extended Pine Ave. 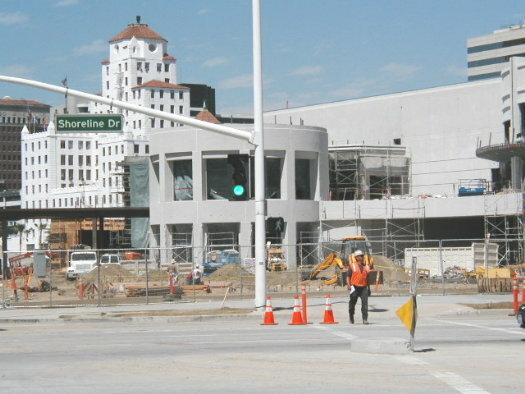 In our opinion, this section resembles parts of Ventura Blvd. in the San Fernando Valley. Long Beach City Hall created this land decades ago by filling and paving tidelands. The ocean is in the distance. Visible are Port of Long Beach industrial facilities, which years ago were isolated west of the L.A. river but now sprawl eastward off downtown Long Beach. Sign behind a chain link fence shows what's coming soon. Another view in the tidelands, looking north. Older white building in distance indicates northeast entry to former beachfront Pike amusement area. Sand and shore were southward...near where this photo was taken. Green area is 710 freeway median west of downtown Long Beach, part of roughly ten acres of parcels (most along L.A. river) now carrying tidelands status. They were accepted by the State Lands Commission for state taxpayers in exchange for giving up tidelands designation on about three acres of commercial footprints within the Pike at Rainbow Harbor development. 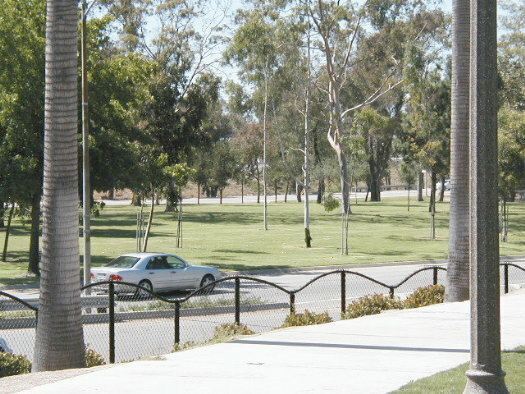 Freeway median is inaccessible to the public and has been dubbed "Asthma Park" by local activists. 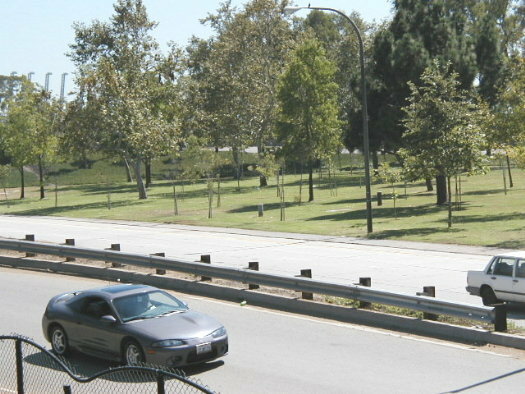 Another view of "tidelands trust" freeway median. Freeway onramp and exit from Long Beach are in foreground; 710 freeway approach to downtown Long Beach is on far side of median.